Certainly one of the best looking cars ever! Black one is faster,silver is more civilized.I would cheerfully take any of the three. Rub in in, why don't ya. I graduated from High school in 1969. I immediately went to work for a bank as a computer programmer. My dad and I went to look at the car I wanted as my first car on a Saturday. It was a Jaguar XKE. It was priced at $5500, about double what the Camaros and mustangs were going for. When we got home and talked it over, my dad was against buying it. He said that was an awful lot of money for a car. I explained to him that I was living at home, had a job at a bank, where I presumably had good credit, and if I didn't get it now, I would probably never be able afford a car like that again in my life. On Monday morning I got my notice from the draft board. I was right, I was never in a position to afford a car like that again. 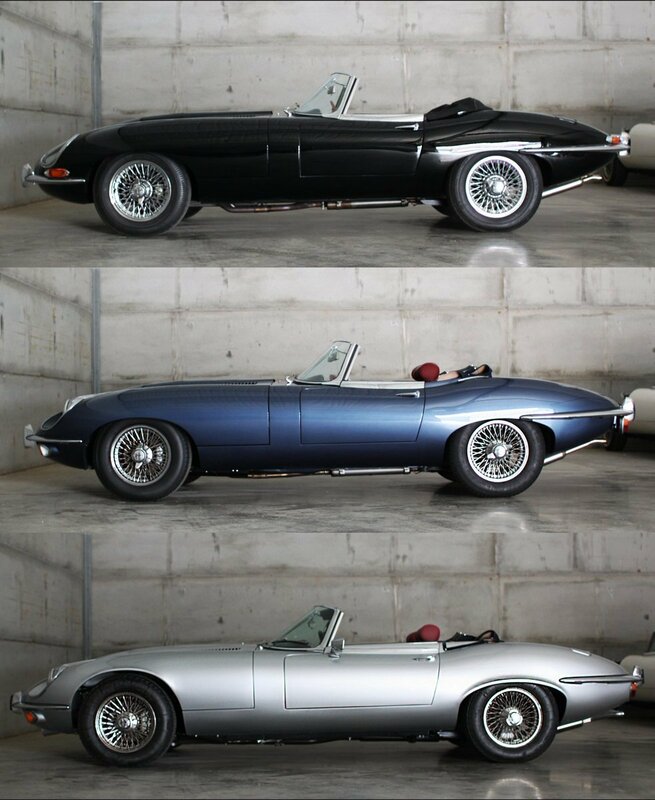 The black one for me, it's a Series I with the faired in headlights and is therefore the best looking. The blue one is a Series II with the exposed headlights and higher bumpers mandated by the US DOT. The silver one is a Series III with the V12 but also a reshaped grille and (shudder) rubber bumperettes. Does it come in dark pine green? I never could understand why, but my Dad (usually a very sensible & intelligent man, a Navy Cdr.) hated the XK-E with a passion. He never had one, don't think he even knew anyone who did, but if he saw one on the highway he'd turn red & yell imprecations at the "idiots who drive those idiotic things!" There was no use arguing with him, he had his mind made up & there was no changing it. Personally, I thought they were beautiful from the moment I first saw one, and would still love to have one. Oh well, maybe the next life! rust slathered gear whining stinking rotten wool carpet and smiths instruments with lucas prince of darkness electrics which constantly allows the smoke to escape the wiring harness and not the least is the horrid cooling system and the leaking bonnet which allows water to pool in the footwells providing for the stinking rotten wool carpet to be stinking and rotten and rusting thru the floor to provide drainage for the leaking bonnet.